I’ve always been the one that brings dessert to family events, mainly because I am thoroughly obsessed with my local bakeries and now have my fam hooked on treats that are readily available to us lucky Marrickvillians. 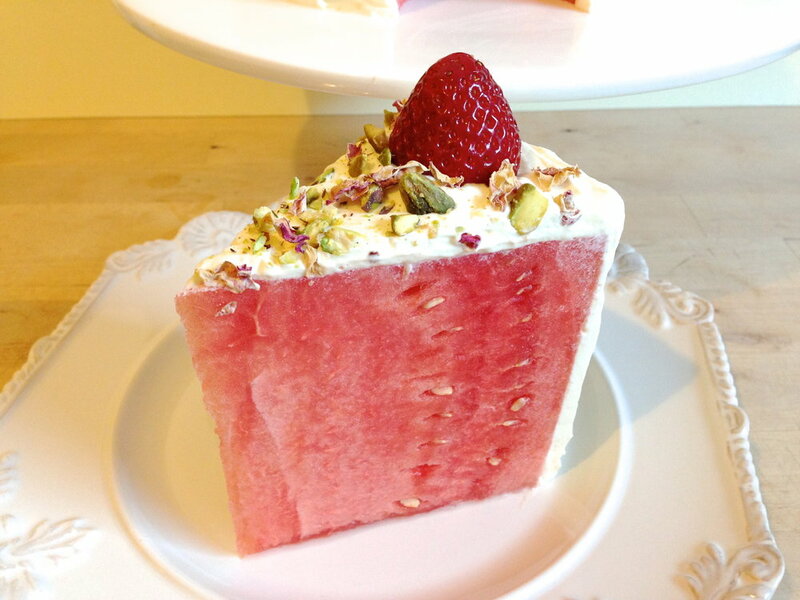 So this watermelon cake concept is definitely not something I came up with, (and there are a million images on Pinterest to prove that) so I’m not claiming originality here. But when Elaine suggested I give it a shot, I thought of how I could turn it into something that my family would appreciate. It’s no secret that one of my favourite local treasures is Black Star Pastry in Newtown. There’s something about the Strawberry Watermelon Cake that takes me back to the flavours I grew up on, instantly reminding me of my happy, passionate mum who always took pride in her national dishes. With the flavours of my childhood as the inspiration behind this recipe, I knew that this was one even my not-so-sweet-toothed dad would enjoy (the happy receiver of the first slice). And yes, he loved it. With the skin still on, cut away both ends of the whole watermelon leaving at least 5 inches in the mid section. From the midsection, cut away the outer skin with straight, consecutive cuts, ensuring a cake like shape as you turn the watermelon. Use a ruler to make sure the height of the melon is the same the whole way around. If you have any bulgy sections, shave back the bulge with a knife so that the sides of the melon are as straight as possible. Wrap the melon with paper towels so that the excess juice is absorbed. Let the melon rest in the paper towel wrap while you make the rose cream. Don't be tight with the paper towels! In a stand-alone mixer using the paddle attachment, beat room temp mascarpone cheese and thickened cream until combined and slightly thickened. Add the powdered sugar and drop the rose water into the mix, one teaspoon at a time. Beat on medium speed until soft peaks form. Unwrap the melon. Generously apply the rose cream to the top and sides of the melon, making sure that your application is thick enough to cover any visible watermelon. Top with berries, crushed pistachios and rose petals. Best served the same day, and still delicious the next!